Disney’s Descendants is a modern Disney Channel Original Movie classic—and by classic, I mean it is both delightfully campy and a clear and craven attempt to mine the old animated movies for more money. It’s basically High School Musical meets Once Upon a Time, except none of the lip-syncing actually matches the soundtrack, which will slowly drive you mad once you notice it. And now the fashion choices of its stars, all children of classic Disney villains, are even more dire. At the end of Descendants, Ben and Mal got together, in addition to turning Mal’s mom Maleficent (Kristin Chenoweth) into a small lizard. So it appears someone’s new girlfriend has given him a makeover. But there was a hint that Mal wasn’t actually as good as she appeared. How that thread will be picked up by the sequel, we don’t know, but it looks like Ben has at least been influenced by his new friends’ style. 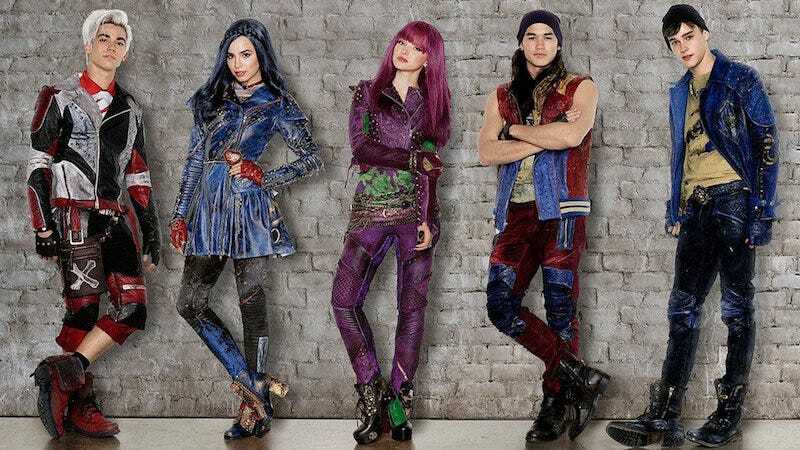 We also know that new Descendants are joining the cast: Uma (China Anne McClain), daughter of Ursula; Harry, son of Captain Hook (Thomas Doherty); and Gil (Dylan Playfair), son of Gaston. No one gets any points for figuring out the complicated system Disney uses to come up with these names.